We seem to have found a new thing we love to do. I’m not the most “outdoorsy” guy. I like being outside, but I’ve never been one to spend a great deal of time beyond the paved road. But I learned something important. There are just some incredible sights you cannot see from the paved road. Here’s an example. The picture here was taken from the gravel parking area where the hiking trail began. It’s pretty and green, but there’s nothing spectacular… just the promise of finding something amazing along the trail. We chose to follow the trail. 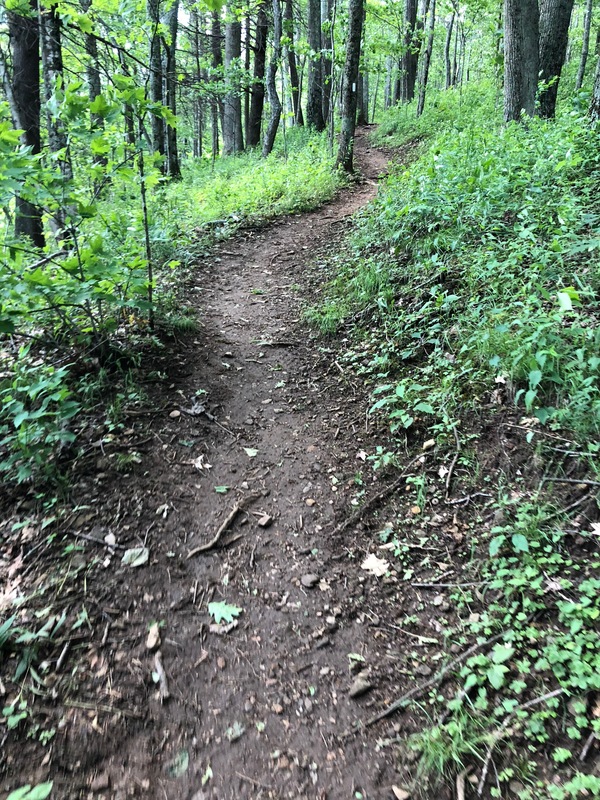 It led to a long, vigorous climb full of mud-holes, slippery rocks, narrow paths, steep stretches, many switchbacks, a few tricky crawls… and so much wonder. While it’s not a particularly encouraging thing to say, sorrow is inevitable. It’s a part of the human condition. People die. Disease destroys. Violence terrifies. Agony ensues. Hurt happens. Sorrows come in many shapes and forms and depths and terms. We may have moments of reprieve when the clouds of heartache are thinner or more sparse, but sorrow will come. We may even live for long periods of time without tasting the depths of these things that so many around us face, but it will find us. Often it seems people get this idea that a follower of Christ somehow gets a pass on the sorrow of life, but Jesus never said anything of the sort. In fact, he said quite the opposite. In John 16, we see Jesus teaching his followers about things to come. He didn’t tell them they were exempt from sorrow, but He does give some desperately needed perspective. There are some strange things here, but let’s keep in mind what John’s over-arching purpose in recording this gospel record really was—to show that God really came here into the mess of this life to show Himself to us. With that in mind, we look at this passage and find a powerful promise of transforming sorrows. Jesus had been telling His followers that His departure was imminent. They were filled with trepidation at this news. It did not in any way fit their expectations of what He had come to do. He said that soon they would be unable to see Him. But then, some time after that, they would see Him again. They didn’t understand. Jesus’ explanation was not one of sunshine and rainbows. But did you see that last part of that verse? He promised that, “your sorrow will turn into joy.” Strange, isn’t it? How can that be? Whoa… that’s what I would call a truth bomb. While at first it doesn’t make sense that sorrow could somehow turn into joy, Jesus gives the perfect, almost universally familiar, illustration. I’ve witnessed a few babies’ births. It’s one of the many reasons I very plainly own the fact that my wife is so very much tougher than me. She’s a superstar. But there’s no denying that it involves an intensity of pain and struggle that is unique and profound. But Jesus was, of course, spot on in saying that, once the baby is born, the pain and struggle fade almost entirely out of mind because of the overwhelming flood of joy that comes with welcoming the precious child. Jesus seems to be teaching us that the heartaches that we will experience in this world, despite how very real and painful and intense they may be at times, will fade out beyond recollection when the joy that is to come finally arrives. Jesus goes on to say that, while He would not longer be there in person to ask, by His Spirit within us we could and must boldly approach the Father in His name and have confidence in His answers that would be for our good and for His glory. For, when we are genuinely filled with His Spirit, we will pray for the things that bring Him joy and fill us with purpose. We will seek what draws us and others nearer to Him. The sorrow of separation through the inevitable vale of death will be transformed into the joy of His everlasting presence. The sorrow of disease wreaking havoc upon these bodies will be transformed in the wonder of a body made entirely new. The sorrow in the ripples of the violence of this age will be transformed in the eternal, unbreakable reality of a peace beyond our understanding. The sorrow of agony from fractured relationships will be transformed into unity with one another and oneness with and in Christ. The sorrow resonating from the constant hurt in this broken world will be transformed as the last remaining tear is wiped from our eyes. There’s no “get out of sorrows free” card, but there is a promise of sorrow transformed. And, like the agony of labor pains, it will be worth it.